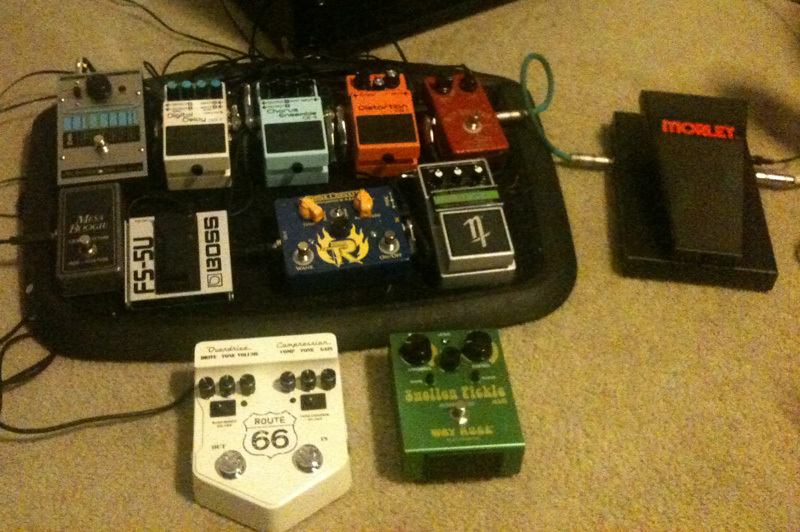 Today’s pedal line is from Jason McGuffin. If you have a pedal line (doesn’t have to be in a board) for your rig, please email me a photo, bio, description of pedals and routing to pedalline@nulleffectsbay.com. Every Friday I’ll showcase a pedal line submission. Make sure you include any links to your band or music page. Hello! I am a guitarist/sound engineer at First Baptist Church in Owensboro Ky. As the Sound engineer, I don’t get to play much, but I do have several guitarists there at the church who on occasion will need to utilize my gear. As we do modern worship, we need to be able to have a wide variety of tones available based on the week. This setup seems to work best for me. I use a Morley Bad Horsie Wah, into an HAO Rust Booster to add some presence and sparkle to the signal, (also to add hair to some of the OD/DS pedals too.) After that is the Nobels ODR-1 plus 10th Anniversary OD. Hands down my favorite TS clone. That goes into an HBE/Rig-Talk Plank Cranker, serial number 7 of 30. This is actually a bluesy TS clone on one side, and an amazing boost on the other, with footswitchable bass boost on both. After that it is to the old faithful japanese Boss DS-1 into a Boss CE-5 and a Boss DD-7/ The Boss FS-5U is for the Tap Tempo functions of the DD-7. The EHX Holy Grail completes the signal path that ends with a trip into the tube goodness of a Mesa-Boogie Studio 22. I swap in and out a Visual Sound Route 66 and a Way Huge Swollen Pickle MK2 for other flavors as I need them. Hope you guys like! I’m hoping to upgrade to a G-System soon to better utilize the great sounds/fx loop of my amp, and get more control/mod sounds.